Don’t let anyone tell you-you don’t deserve the world. Especially yourself. Feeling a desire to be more than a mom does not make you a bad person. It does not make you a bad mom. You are a big soul and you are meant to take up space. If you feel like you were made to conquer more than motherhood, then you are right. Don’t downgrade your dreams or convince yourself you’re incapable. You are capable. Your children will be gone someday. This isn’t your forever. If you dare to dream past tomorrow, don’t deny yourself those dreams. Tomorrow will come, and the kids will leave the house. Don’t let that day come and be left with only a dream. When you don’t financially contribute to your home, it can make you feel like you are less deserving. It can make you feel like you don’t deserve to have a say in any financial decision. This is not true. When you’re not bringing in any money, it can be hard convincing yourself to spend any. Especially on things for yourself. Quit minimizing all the things that you do that bring far more valuable than money. The sleepless nights, the meals made, the floors swept and windows washed. Your house would fall apart without you. You are shaping who your children will become day in and day out. Money cannot measure your worth. If you feel the need to make money and do more outside your home, then do it. Take baby steps toward more than motherhood. Don’t feel ashamed of these desires. Rather than letting being a stay at home mom stand in your way, let it be your chance to get creative. Find ways to make money with your talents. Let nap times be your side hustle. Fight to find yourself even when everyone else demands your attention. Work from home. Start a business. Sell your crafts. Take photographs. Run a blog. I did the last two as a stay at home mom. So can you. You can live your passion as a stay at home mom and it will show your children that it’s ok to keep living passionately even when there are obstacles. Most days being a stay at home mom will be mediocre. You’ll feel like you’re just treading water. You will get things wrong in motherhood and in the pursuit of your dreams. Keep going. When you work to accomplish a big dream, there will be things that try to hold you back. Don’t let them. There will be people who make you doubt yourself. Don’t do it. If you feel that fire in your belly telling you-you were made for more than motherhood, then you’d better listen. Don’t spend your life ignoring a calling that might be bigger than you’ve ever dreamed. If you were made for more than motherhood, keep going. As you shape your children, are you nurturing yourself? Are you showing them each day what an amazing person you are and everything you are capable of beyond Cheerios and spit up? Show your children what the pursuit of dreams looks like. Be an example of a person who never gives up on themselves. Do you want them to live their best life? Do you want them to chase their dreams every day? Then pave the way and show them how it’s done. Do you need money to make that dream real? Will you need a babysitter? Do it. Find a way to make the money that will make your dreams come true. Work part-time. Start a side hustle. Find a way to knock all obstacles out of your way. Because your dream is worth it. You are worth it. Don’t give them a stay at home mom who is tired and feels empty because of an un-lived dream. Show them how to shine. They are learning from you every day. Give them one more good example. Wake up early…or stay up late.. I know you’re tired. Maybe the night shift was tough. I get it. I have been there. When your only alarm clock is screaming kids, maybe consider a new one. Set an alarm for time for yourself. If you want to dedicate your entire day as a stay at home mom, then give yourself the morning to be a woman on a mission. If an early morning makes you cringe, then do early bedtime. Tuck the kids in with a story and get intentional about time for yourself. Stay at home moms only get breaks when they give them to themselves. Give yourself a break. 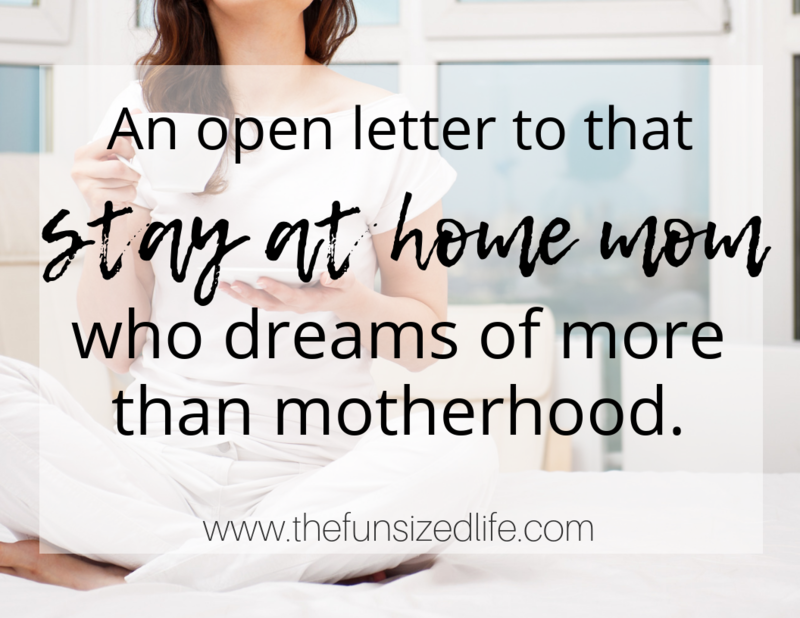 Find a way to make time for your more than motherhood dream. You’ll never regret that you did. You can love your children fiercely while still creating a life beyond motherhood. It doesn’t make your love for them any less real. Show them love each day and be intentional with your time. Being a stay at home mom and pursuing a dream isn’t easy. It takes planning and time. It takes patience and intention. Some days you may have to force yourself to stop hustling and get back to just being. This is where I struggle. I love writing and working so much, that I often never want to stop. I stop anyway. The laptop closes and I devote the next 5 hours to them. Make no mistake, I make time for myself again while they are playing or sleeping or watching TV. If you could do one thing for your children, it would be to do more for yourself. An empty vase will cause all the flowers in it to slowly wilt. So fill yourself up, you stay at home mom. Nurture your soul and I promise you theirs will flourish. Don’t be ashamed if you feel like you were made for more than motherhood. Don’t think being a stay at home mom means that it is your only purpose in life. Only you can feel that burning desire for more. Let it out. Give it room to breathe. My greatest fear is losing myself while helping my kids find who they are. So I make a point not to let this happen. Don’t let this happen to you. And just know, that I’ve got your back. I have been a SAHM for 21.5 years. My youngest is a senior in high school and I will be an empty nester soon. I have 3 grandchildren. My family is my life. I’m not ashamed of that. The only thing that comes before them is God. My dream was always to raise successful children and I’ve done that. I have never felt guilty for not contributing to the income. This was and still is my dream life. I have no plans to return to the work force. I have plenty of things and projects to keep me busy. That’s so great! My grandmother sounds like she was a lot like you. She dedicated her life to her family and her grandkids. Truly amazing.